What is Chinese Confinement diet ? In this post I talked about what Chinese confinement diet and its practice are and why most Asian women practice this after birth for at least 30 days. It is a dejavu to be talking about “confinement” again. 35 months ago I had my confinement for the first time after giving birth to our daughter. If you ask me what is confinement ? I will tell you “Lots of ginger, sesame oil, Chinese herbs, Chinese wine” 🙂 and also involves not much shower to sum it all up. Getting pregnant is one of the most important moments for a woman in her life. From pregnancy to labor, a woman needs good nutrition to nurture the fetus. After giving birth, the Chinese believes that there are lots of physical changes in a woman body. A woman will lose lots of her strength and wear down her physical function after giving birth and there is a need to recuperate. Confinement has what become a tradition that has been deeply ingrained in Chinese society. The confinement period usually starts after the mother gives birth and in this modern world, discharged from the hospital. The new mothers observe various routines fairly diverse from regular day-to-day living for a period ranging from few weeks to baby’s first-month celebration. The mother is usually not allowed to go outside (hence the term “confinement”) for 30 days. Other routines primarily include following a special confinement food menu tailored to help accelerate the mother’s recovery from her “weakened” body post childbirth. This special diet is made up of confinement foods targeted towards specific functions like dispelling “wind” from the body, quelling heatiness, boosting blood circulation, revitalizing strength etc. The mainstay of confinement food comprises common ingredients found in any regular Chinese diet: ginger (tons of it as a matter of fact), eggs, sesame oil, black vinegar, Chinese rice wine, pepper, black chicken (is is literally black in color and only available frozen in asian grocery store here in the U.S.), free-range or organic chicken, fishes, and pork. 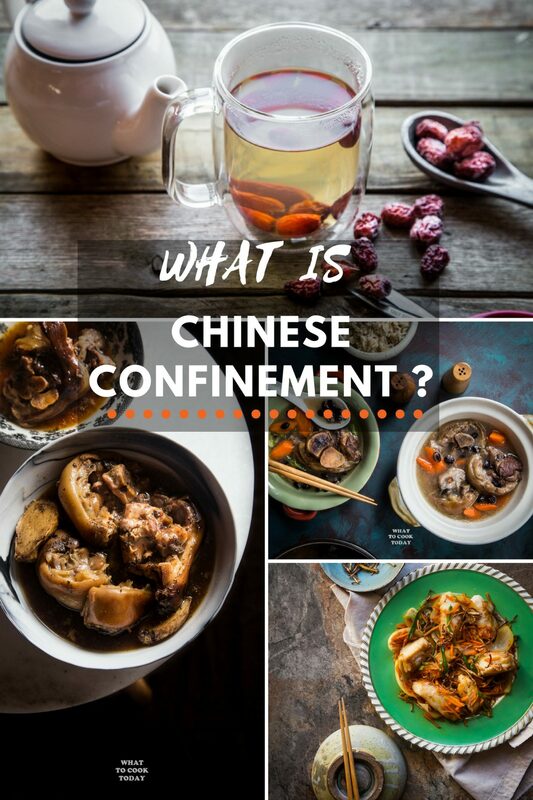 Other ingredients of confinement food include fairly general herbal provisions like Chinese Wolfberry/ Goji Berry (Gou Qi), Angelica Sinensis (Dong Quay), red dates, black dates, dried longans, and whole bunch of other Chinese traditional herbs. Apart from harnessing healing benefits from food, numerous practices are abided to as reinforcements and preventive measures against the possible onset of ailments commonly associated with post delivery aftermaths eg. postnatal hair loss, back aches, rheumatism, premature aging etc. In essence, the list of practices are meant to shield the body from excessive exposure to elements like “wind” and damp air, both of which are believed to be main culprits responsible for causing bodily aches and pains, migraines as well as rheumatism. I’m fortunate enough that my mom can be here to help out during this confinement period. I know many Asian friends of mine specifically hire a “confinement lady” to help with cooking and taking care of their babies during this one month. I know you probably won’t jump up and down over this confinement diet either, but I thought it would be interesting to share this experience with some of you who probably have no clue that most Asian people (I can’t say all) go through this confinement period. Wish me Luck again !! I’ll be back in full force. This time with a 3-year old and one newborn. Here are Confinement Recipes I managed to capture from two round of confinement food my mom prepared when I had both of my kids 🙂 It’s not that many but I plan to update and add more when I have a chance. interesting post, never heard about this tradition before. Good luck, hope everything turns out as you want. Hi there, thanks so much for these useful recipes especially confinement foods. Congratulation to you 🙂 January 2012 will be here in a blink of an eye. Woah….DIY confinement ? where do you live btw ? It will be easier if you have someone to help you to cook during that time. You did so well last time…..do not mess with tradition! I believe that there is truth to everything you have said about confinement processes. They have worked for many more years than we have been here and that is the only proof I need to agree with….wishing you the best and SO happy your Mom can be with you again. My Mom was able to come when both my boys were born, totally awesome! Yes 🙂 How funny that you stumbled upon this site 🙂 How are you Vivi ? Hi. I stumbled across this whilst googling for methods or things to do for a faster recovery. Have you heard of sitting on hot stones? I’d be interested in finding out what other wives tales are done to aid in pp recovery. I’m A Vietnamese Mum to be and 12 weeks soon! And trying to research as much as I can. So far your blog is the most informative. I can only share with you from my own experience after having two kids. I don’t personally believe there’s a diet that can specifically spot-reduced certain area of our body (unfortunately). If you are nursing your baby, make sure you get enough good nutrients and don’t worry so much about losing weight at this point. You will continue to gradually shed off the weight you gained from being pregnant. This is busy hectic time for you when the baby is still a newborn and perhaps lots of lack of sleep too. I remember it clearly with my two kids! Once I felt more comfortable and started to get a hang of things, I started getting back to exercise and watch the portion I eat. Hi , this is most interesting ! We muslim Indians also believe in a confinement period …. more like 40 days . The new generation are less stringent but that’s sad . We also include a lot of ginger to warm the body and baby thru breastfeeding . Lots of nuts and healthy eating and off course lots of rest . Usually we go to our mum’s place for a few weeks . Or vice versa . Thank you so much for sharing! I never knew that Muslim Indians will do confinement too. I agree that this tradition will probably die off with my generation 🙁 As a kid I saw and heard about people did confinement after having baby all the time. But, my own kids will never have a chance to get exposed to this tradition simply because they know nothing about it 🙁 I truly believe that the confinement period and food do help out a lot in restoring my strength and not to mention with mom’s help!! what a luxury!!! thanks for sharing your confinement recipes. They all look good! I am expecting my second child and want to be more prepared this time as i won’t have a confinement nanny to help. Can the soups and other meat dishes like the sweet vinegar pork trotter be made in advanced and frozen? Heard confinement is the best time for mums to rid of ailments like rheumatism, asthma. The body absorbs the medication well..
Hi OT, That’s what my mom kept telling me too! She said any “existing” ailments you are having will be gone if you do a confinement properly, proper rest and proper confinement diet. My Daughter-in-law will be dyed to deliver her first child in April. How exciting! I wish her good luck and hope everything goes smoothly for mommy and baby! I’m no expert in confinement, but according to my mom, the first three should be okay and she said to avoid eggplants during confinement. They are considered a “cold” food for confinement. I hope it makes sense.